AS: You were born and raised in Connecticut and have been a professional artist since 1968. Tell me a bit about your art background. Pat Lay: I come from a family of artists. My great-grandfather was an eminent New York portrait painter. My grandfather was a well-known landscape architect in New York and also a painter. Both of my parents have degrees in painting but after the war my father became an engineer and my mother a designer of solid-state circuitry, both working frequently for the space industry. My mother painted commissioned portraits in our living room in Connecticut when I was a young child. I was surrounded by artists as a child, visited art museums in NY on a regular basis, and took painting lessons starting at age 9. From a very young age I knew that I wanted to be an artist so I pursued art for my undergraduate studies at Pratt Institute and afterwards graduated from Rochester Institute of Technology with an MFA. At Pratt I met the artist Kaare Rafoss. We have been married since 1963. Extensive travel has also informed and inspired my work. I traveled with my mother in 1962 to thirteen countries in Europe visiting almost every art museum and cathedral on the map. David Smith’s sculptures in Spoleto were a highlight of that trip for me. In 1968 I entered the art world as a sculptor working in clay. In 1975 my work was included in the Whitney Biennial. More recently, travels in Asia, Africa and South America have altered my view of what is meaningful, and visually powerful in art. Non Western Art is non formalist, ethnographic, more in touch with the intuitive and the human soul. The art works usually create a tension between the present cultural reality and the emotional and spiritual realm. AS: You seem to focus on technological metaphors in diverse formats. What draws you there? 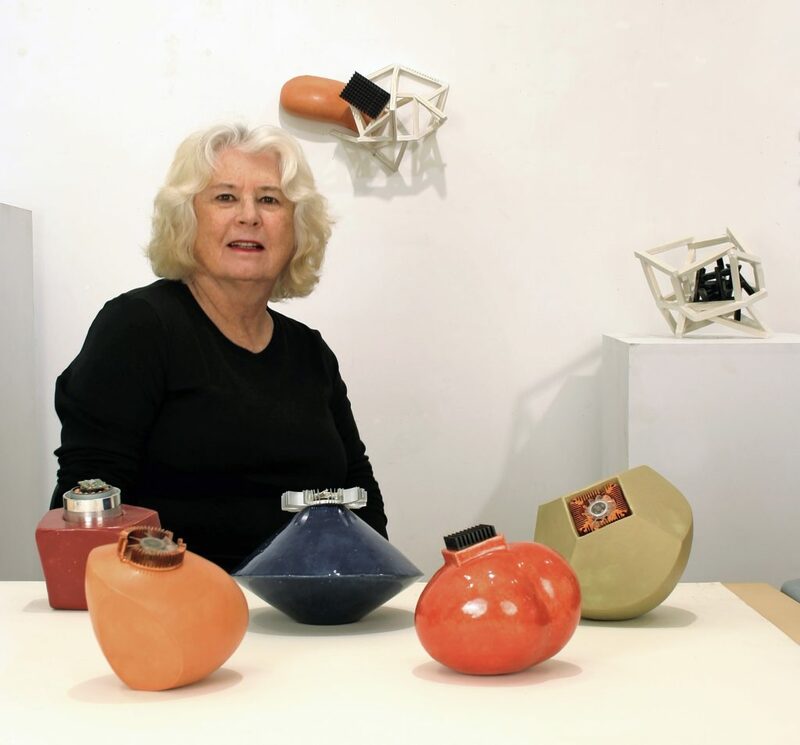 Pat Lay: I have always been interested in the juncture of math, science and art. The contrast between nature and manmade. 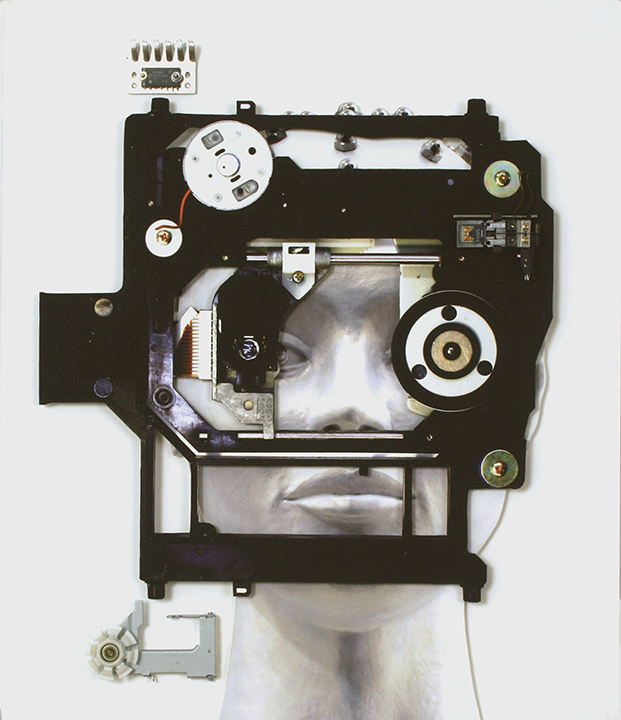 Since 2000 I have been exploring hybrid forms to refelct a time of rapid technological changes –how the computer is central to our lives; how the body and mind are augmented and assisted by technology. As a result of this thinking I started dismantling computers. What I discovered inside was very exciting: colorful anodized aluminum cooling elements, wires, the beautifully designed hard drive, the minimal geometry of the processor, but most exciting was the motherboard or circuit board, a map of a new interior world. In parallel, visiting museums has become an important and integral part of my practice. The African Art wing at the Metropolitan Museum has been my go-to place for inspiration for many years. My embellished head sculptures from 2001 to 2011 were influenced by Nkisi n’kondi/ Minkisi power figures of the Kongo peoples of the Democratic Republic of the Congo. The DADA exhibition at MOMA in 2006, occurring when I was making both sculptures and two-dimensional works, made me question and helped me to better understand the paradoxical relationship between human consciousness and technology. Raoul Hausmann’s “The Spirit of our Time,” 1919, which was in the exhibit, piqued my interest in the use of readymade forms and mixed media. Starting in 2000, my power figures combined and hybridized human elements and technology. 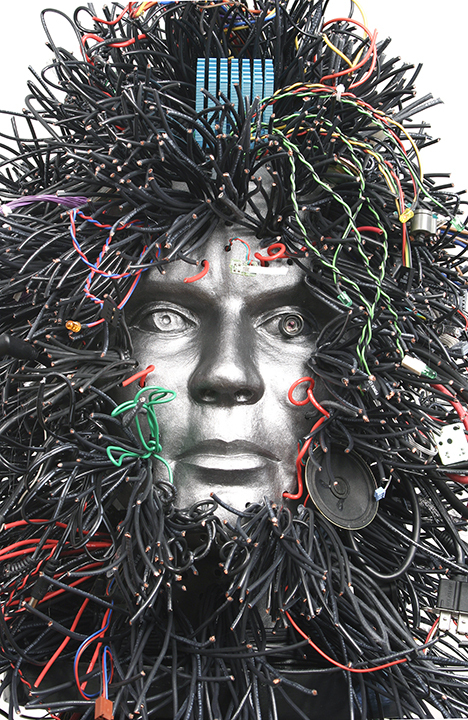 This work incorporates fired clay, steel, mixed media and ready-made computer parts. The computer parts harbor intelligent data, imply a function, offer protection and emit power. Dada and Surrealism have been a profound influence on both the sculptures and the earlier collage works: Picabia’s “machines”; De Chirico’s metaphysical juxtaposition of objects (The Great Metaphysician, 1917; The Song of Love, 1914; The Disquieting Muses, 1917); Max Ernst’s early Surrealist works (Oedipus Rex, 1922; Women, Old Man, and Flower, 1923-24) and Magritte’s hybrid, metaphorical images. AS: Your digital 2-D works conjure for me an array of visual and cultural associations – Persian tapestries, byzantine mosaics, illuminated manuscripts – underscored with an algorithmic logic. Is that on your mind and what’s your take on that? Pat Lay: Yes, the work looks to art history for ideas and questions that are universal. Art comes from art. Historical works inspire new works. History gives me structures that I can work with. In 2003 I started a new series of works on paper that were inspired by several exhibitions at the Metropolitan Museum of Art. 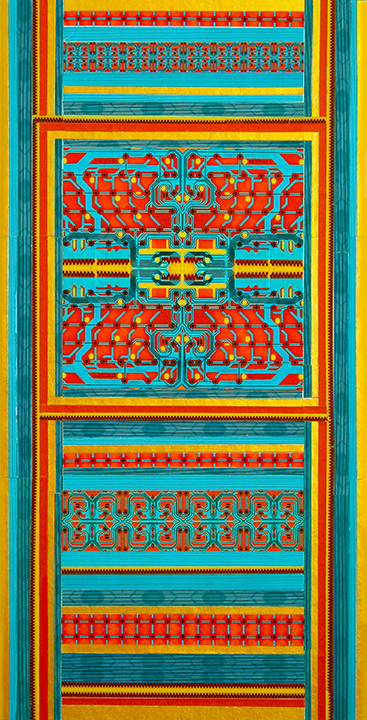 The structure, patterning and border designs of the Persian carpets and Persian miniatures pointed the way to transforming patterns into digital structures. 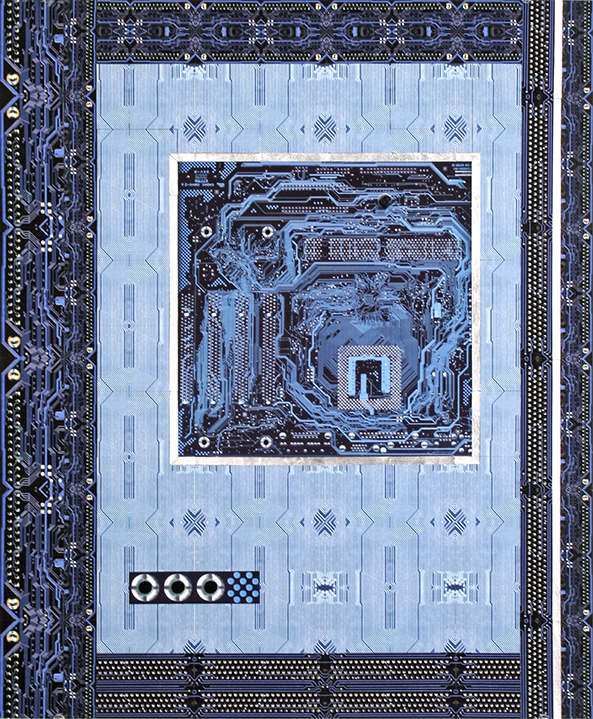 The circuitry of the motherboard became the digital media for creating new digital collages. At the Rubin Museum in New York City I came to appreciate the power of Tibetan thangkas. I realized that I could work with paper in a much larger scale, up to 96 x 48 inches and turn a religious icon, the Tibetan thangka, into a contemporary abstract composition that serenely captures our world of technological advancement. At the same time the scroll format was a practical way to make large works easily portable. Meditating on the past, present, and future, my scrolls question and critique our paradoxical relationship and obsession with technology and what it now means to be human. AS: You are at home with both digital and sculptural forms. Let’s start with digital – what is your process? 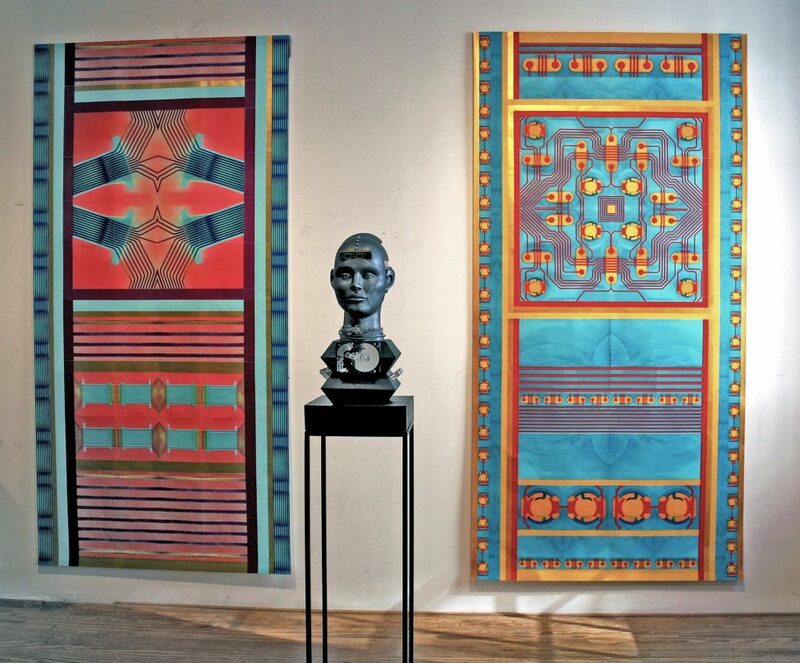 Pat Lay: During 2014-2016 I was concentrating on a series of large collaged paper scrolls, 96 x 48 inches. 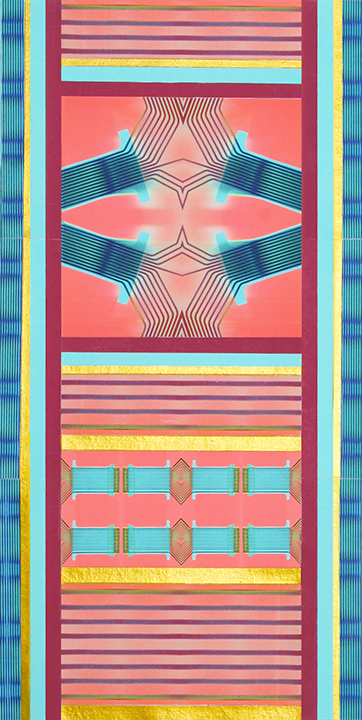 Digital images scanned from computer circuit boards were printed on Japanese kozo paper and collaged into patterns that were transformed into a larger matrix: a logic with an aesthetic gestalt. AS: And your sculpting process? 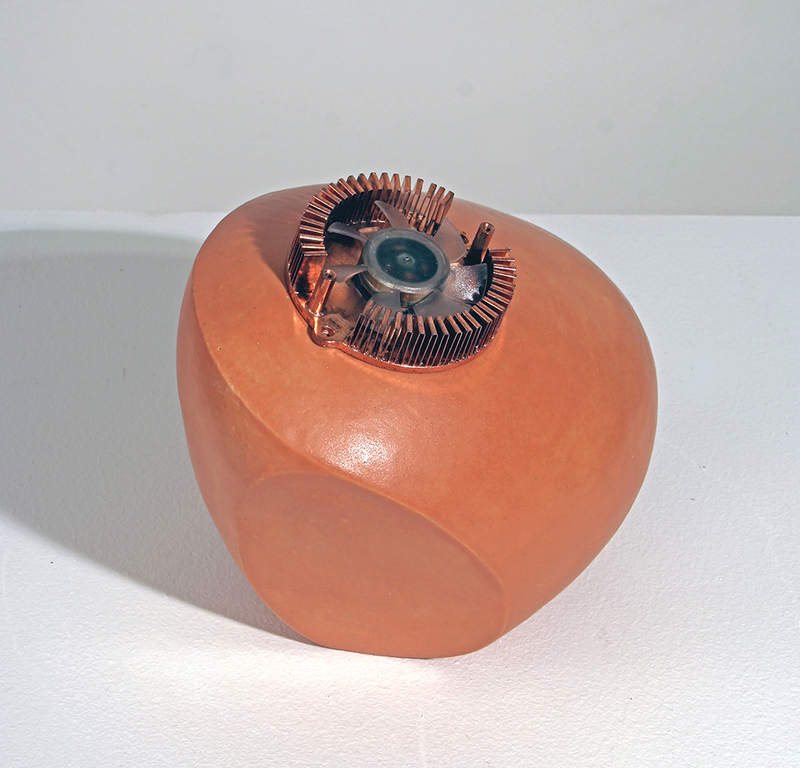 Pat Lay: With the current work, the “Soul Bots” series, I start with a computer part (I have been using aluminum heat sinks and heat sink cooler fans) and a solid ball of clay about the size of a melon. 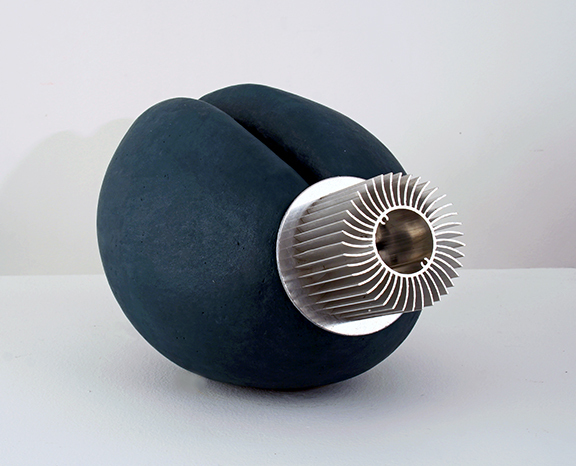 I shape the clay into a form that is either organic or a combination of organic and geometric. The computer part is crucial to the design of the clay form. When the clay is stiff I cut the form in half, hollow it out and then reform the two halves back together. After the work is completely dry I glaze it and then fire it to a mid-range temperature. After the firing the computer part is epoxied on to the clay form. AS: How do you see the relationship between your digital and sculptural work? Pat Lay: All of my work deals with related issues. How do we as spiritual beings adjust to a culture and environment that is rapidly becoming more reliant on technology? How are we as humans changed by the new advances in technology? Working both two-dimensionally and three-dimensionally gives me the opportunity to explore different kinds of space and various media. AS: Your 2 latest series, “Soul Bot,” and “Z4E2” involve fired clay and seem to me as a shift in your work. What can you tell me about this new work? Pat Lay: I am back working with clay after almost a five-year break from it. For most of my career clay has been my primary material. Starting in 1998 I became interested in two-dimensional works; then for a number of years, I went back and forth between two and three dimensions. By 2012 I was working exclusively in two-dimensions. But since 2017 I am back to working in clay. I love clay. I wish I could work in two-dimensions and three dimensions concurrently. But it doesn’t work for me. At some point I will go back to the collage works on paper but for now I am happy with the clay. These are hybrid forms, robots, that question the human condition, the interface between man, nature and technology. AS: You have had substantial educational roles. Can you share some of them and how they affected your art making? Pat Lay: I taught at Montclair State University for 42 years. I was the founding director of the MFA in Studio Art. The program ran from 1999-2017. The courses that I have taught at Montclair State include figure drawing, sculpture in clay and MFA seminars that included visiting artists and discussions of the business of art. I also ran a visiting artists lecture series for undergraduates for about 35 years. Having visiting artists come to Montclair State on a weekly basis kept me active in the larger art community and was a stimulation to explore new materials and concepts. And the students, both graduate and undergraduate students were continuously expanding the definition of art, questioning its purpose and exploring new ideas. This kind of questioning and art activity is energizing and inspirational. Pat Lay: At the moment I am continuing the “Soul Bots” series. When this series comes to an end I want to start a new series of collages that continues the use of digital data but also introduces forms from the natural world.